Total waterpark related development spending is expected to grow in 2016 with a number of new facilities opening and many expansions of the existing waterparks occurring. Two major new indoor waterpark resorts opened in the Poconos in Pennsylvania in 2015 and three large indoor waterpark resorts are projected to open in California, Colorado and Quebec in 2016 (including two Great Wolf Lodge properties). In 2015, 17 municipal waterparks and one private outdoor waterpark opened, while in 2016 we project 14 outdoor waterparks to open with equal numbers of private and municipal facilities. The largest privately owned outdoor waterpark will open in Texas with 27 slides. We attribute the waterpark industry’s continued growth to properties offering a variety of amenities and attractions that attract existing and new guests to the waterpark experience. An indoor waterpark resort is a lodging establishment containing an aquatic facility with a minimum of 10,000 square feet of indoor waterpark space inclusive of amenities such as slides, tubes and a variety of indoor water play features. A resort with an outdoor waterpark is a lodging establishment with an outdoor aquatic facility with three or more waterpark elements requiring lifeguards such as slides, lazy rivers or wave pools. A standalone indoor waterpark is an aquatic facility that is not attached to a lodging establishment with a minimum of 10,000 square feet of indoor waterpark space inclusive of at least three amenities such as slides, tubes and a variety of indoor water play features. An outdoor waterpark is an outdoor aquatic facility with three or more water slides. It often also includes other water elements requiring lifeguards such as lazy rivers, surf simulators or wave pools. These parks will often offer additional splash features for younger children. There are 996 waterparks in the U.S. as of February 2016. Although a number of waterparks were built last year, this number has grown significantly from our 2014 annual report of 858 due to H&LA’s ongoing examination of markets across the country. We are constantly discovering waterparks (primarily municipal) that have not previously been listed on various databases. We also re-examine our waterpark definitions as the country’s waterpark landscape changes. The Midwest and South are home to the majority of waterparks, 396 and 323, respectively. The Midwest slightly lands ahead of the South for number of outdoor waterparks (271 versus 267), while the Northeast has the fewest at 71. The Midwest leads the nation in indoor waterpark resorts by a large margin with 100; the closest is the Northeast with 16. The West leads the country in standalone indoor waterparks with 36 primarily due to the existence of 18 municipal indoor aquatic facilities with waterparks within the state of Utah. The South leads in resorts with outdoor waterparks with 34 due to the warmer climate, which allows resorts to keep their outdoor waterparks open for longer seasons. In 2015, indoor waterpark resorts added 243,000 square feet of indoor waterpark space in North America. Although larger than 2014, square footage increases have been low since 2008. (The high point was a 900,000-square-foot increase in 2006.) In 2016, we project additional indoor waterpark square footage of 389,000. The following table indicates the indoor waterpark resorts and standalone properties that are opening or expanding in the U.S. and Canada in 2016. This year expects to see three large indoor waterpark resort openings: the 105,000-square-foot Great Wolf Lodge Southern California; the 102,000-square-foot Valcartier Vacation Village Indoor Waterpark Resort; and the 65,000-square-foot Great Wolf Lodge Colorado Springs. The two Great Wolf Lodge properties will add to the 13-resort portfolio of Wisconsin-based Great Wolf Resorts. The company purchased a partially completed Renaissance Hotel in Colorado Springs, Colorado, that stood idle for nearly six years, and will spend approximately $90 million to renovate it to brand standards by late fall 2016. The all-suites property will include 311 rooms, a 65,000-square-foot indoor waterpark, arcade, miniature golf, mini-bowling, rope-climbing attraction, spa, kids’ amenities, four to five restaurants, and more than 20,000 square feet of meeting space. It will not sell day passes to the public. Rooms will start at about $250 a night with waterpark admission included. Great Wolf Lodge Southern California opened in February 2016 as a 603-suite hotel and 105,000-square-foot waterpark. The $250-million Garden Grove resort is Southern California’s first indoor waterpark resort and is the Great Wolf Lodge brand’s largest indoor waterpark. Room rates will range from $260 to $600, and the waterpark will be exclusively for hotel guests. It will offer a state-of-the-art recycling system with mechanized pumps, filters and tanks to purify the water before recirculating it into the park’s common water areas to reduce water waste. Quebec’s Valcartier Vacation Village will add a four-star hotel with 153 suites and a 102,000-square-foot Polynesian-themed indoor waterpark with 14 slides, a family pool, a multi-activity adventure river, a wave pool and a wave simulator. The $65-million complex will make the campground resort into a four-season entertainment complex when it opens in December 2016. The $34-million McKinney Aquatic & Fitness Center will be a standalone indoor waterpark and is listed in both the indoor waterpark and the outdoor waterpark openings for 2016. It will boast competition and leisure pools, sports courts, an indoor track and a gym. McKinney will pay for the aquatic center with park bond money and community development funds, which are generated by sales tax revenue. The 24,000-square-foot indoor waterpark will feature a competitive pool, a leisure pool, a play feature, a current channel and a water slide. An outdoor waterpark will feature a leisure pool with two larger slides, a kiddie pool, two smaller slides, an interactive play feature and a tumble bucket. The following table indicates indoor waterpark resorts and standalone indoor waterparks that opened or expanded in 2015. 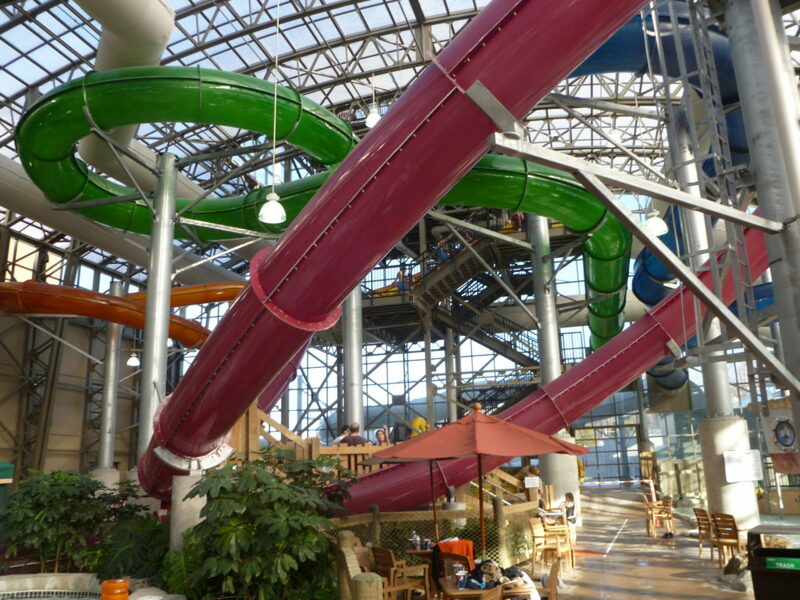 Two large indoor waterpark resorts opened in the Poconos in 2015: the 125,000-square-foot Camelback Lodge and Aquatopia Indoor Waterpark and the 106,000-square-foot Kalahari Resort. Each resort boasts more than 450 new guestrooms. The U.S. supply of waterparks is dominated by outdoor waterparks. Another 14 outdoor waterparks are slated to open in 2016. Typically, the privately owned parks are significantly larger than municipally owned parks, and they charge higher prices for admission and park amenities. However, the average number of slides being added at municipal parks is growing. Last year, most included three slides; in 2016, many will include five or six slides. Seven private and eight municipal waterparks are slated to open in 2016. We expect to learn of more municipal park openings closer to summer. All of the private parks are opening in the South with the majority in Texas and South Carolina. Three municipal waterparks are opening in Texas this year, two in Kansas, and one each in South Carolina, Kentucky and Arkansas. The three largest parks are opening in Texas. Built on 25 acres adjacent to Katy Mills Mall, the $45-million Typhoon Texas will open in May 2016. Project partners are advertising powerful slide pumps to reduce ride lines and provide the cleanest water in Texas. In addition to body slides, tube slides and raft slides, main attractions will include a 25,000-square-foot wave pool, a 1,345-foot lazy river, and a 48-foot-tall children’s play structure. The park has about 20 acres to expand for more rides and eventually build its own lodging and other amenities. The sixth Splash Kingdom will open in 2016 in Greenville, Texas. The airplane-themed Splash Kingdom Air Patrol’s main entrance will be designed to resemble an airport runway. The wave pool will be partly in a hangar with a lazy river flowing through it, and children will be able to climb into an airport control tower and slide down the wing of an airplane or the cargo area of a helicopter. The park is expected to anchor the Greenville Towne Center mixed-use development. Water World will sit on 25 acres behind the go-kart track of Rigby’s Entertainment Complex in Warner Robins, Georgia. The first phase of the park will have a wave pool, a 1,250-foot lazy river, a kid’s zone and 11 water slides. The property will add 30,000 square feet of dry entertainment space, including 12 bowling lanes, three party rooms and 40 new games. The pirate-themed Scuttle’s Island in North Augusta, South Carolina, will span approximately 40 acres, with 24 attractions, including slides, a wave pool, a lazy river and a kids’ interactive area. The projected 2016 openings include far more privately owned outdoor waterparks than opened in 2015, as shown in the following table. Of the 17 outdoor waterparks that opened in the United States and Puerto Rico in 2015, all but one were municipal. The only private opening in the U.S. was Splash Kingdom in Nacogdoches, Texas, with eight slides. The largest municipal opening was Surf ‘n Fun Waterpark in San German, Puerto Rico, with 12 large slides, two surf simulators, a wave pool, a lazy river and a children’s splash structure with two small slides. Many traveling families opt for a hotel with a waterpark over a hotel with fewer kid-friendly amenities. It is becoming more of a deciding factor as a greater number of resorts add waterparks. Two resorts in Texas will add or expand outdoor waterparks in 2016. JW Marriott Hill Country Resort in San Antonio, Texas, currently boasts a 36-hole golf course, an adults-only infinity pool, a six-acre waterpark with a lazy river, seven restaurants, a spa and 265,000 square feet of event space. The $16-million waterpark expansion will include additional water slides, a new pool and cabanas. Just north of downtown Dallas, Hilton Anatole offers 1,606 guestrooms; 349,000 square feet of meeting space; a spa; a fitness facility; more than 1,000 pieces of fine art (including a sculpture garden) and four restaurants. Built in 1978 and expanded in 1983, the hotel will add an outdoor waterpark in 2016. It is advertising its latest addition as an upscale resort-style pool complex that will include a lazy river and two slides. In 2015, six properties were developed, added waterparks to their facilities or added hotels to adjacent waterparks. Three of the 2015 openings included hotels while the remaining three were waterpark additions to existing hotels. The Nickelodeon Suites Resort will be rebranded in April 2016 as Holiday Inn Resort Orlando Suites. It will continue to operate as a resort with an outdoor waterpark. The Nickelodeon hotel launched in 2005 in partnership with Holiday Inn; it sold in 2014 for $78.8 million. The rebranding is part of a $30-million renovation, including renovated suites and upgrades to The Lagoon Pool and cafe. The Holiday Inn will feature a renovated waterpark, laser maze, 4-D theater and live entertainment. The waterpark industry continues to grow bigger and better. Slides, rides and attractions become more impressive, and both municipal and private parks seek to attract more people with large numbers of rides, attractions and amenities. Properly located and well-managed indoor and outdoor waterparks achieve strong revenues and net income. Texas is leading the trend with eight new waterparks opening in 2016, including both of the resorts with outdoor waterparks, five of the 14 outdoor waterparks and one of the nine U.S. indoor waterparks. In terms of the total number of openings, proportionately, Texas is dominating 2016 openings. The waterpark industry continues to face challenges in getting larger projects financed as investors and lenders perceive the industry to be more risky than more traditional real estate investments such as apartments. The industry has more risk due to a shorter operating season for outdoor waterparks, which are typically open during the summer season only. High levels of seasonality exist at many indoor waterpark resorts and standalone indoor waterparks that are typically busy on weekends and during school vacations but slow during the week when school is in session. In 2015, two hotel properties closed their indoor waterparks after deciding that the costs associated with the indoor waterpark were not justified by their profits.